June 21, 2017, 7:01 p.m.
By Richard Fletcher and Rasmus Kleis Nielsen June 21, 2017, 7:01 p.m. Despite widespread fears that social media and other forms of algorithmically-filtered services (like search) lead to filter bubbles, we know surprisingly little about what effect social media have on people’s news diets. Data from the 2017 Reuters Institute Digital News Report can help address this. Contrary to conventional wisdom, our analysis shows that social media use is clearly associated with incidental exposure to additional sources of news that people otherwise wouldn’t use — and with more politically diverse news diets. This matters because distributed discovery — where people find and access news via third parties, like social media, search engines, and increasingly messaging apps — is becoming a more and more important part of how people use media. The role social media plays varies by context and by user. For some highly engaged news lovers, it may be seen as an alternative way of accessing news that allow them to sidestep traditional brands, or as a convenient way of accessing news from multiple sources in one place. Importantly, however, most people do not consume news online in this way. For them, the Internet — and social media in particular — is just as likely to be a means of passing the time, staying in touch with friends and family, or a source of entertainment. Some scholars have worried that, in media environments that offer unprecedented choice, people uninterested in news will simply consume something else, with the effect of lowering knowledge, civic engagement, and political participation amongst the population as a whole. This, at least, is the theory. These ideas, however, largely fail to take account of the potential for incidental exposure to news on social media: situations where people come across news while using media for other, non-news-related purposes. In the 20th century, incidental exposure was relatively common, as people purchased newspapers to read the non-news content, or left their televisions on between their favorite programs, and in the process, came across news without actively seeking it out. At the beginning of the 21st century, it was hard to see how this could be replicated online, leading people to conclude that incidental exposure would wane. Even as social media reintroduced this potential — by supplementing people’s active choices (accessing specific websites) with algorithmic filtering automatically offering up a range of content when people accessed a site or app — the concern was that their underlying logic would have a limiting effect on exposure by giving people more of what they already used and less of other things. To assess whether distributed discovery leads to filter bubbles or more diverse news diets, we focus on social media, the most important and widely used form of off-site discovery and consumption when it comes to news. Figure 1. Average number of online news brands used in the last week. Are social media users exposed to more of the same, or to more diverse content? More sources does not necessarily mean more diverse. Consuming news from three right-wing sources arguably constitutes a less diverse news diet than from one left-wing and one right-wing source. But the average number of sources reported in Figure 1 are important to keep in mind. For most ordinary people, incidental exposure to news on social media is associated with a step from using only about one (in the U.K. and Germany) or two (in the U.S.) online news sources per week to an average of about two (in the U.K. and Germany) or three (in the U.S.). When dealing with such low numbers, it is likely that any increase in the number of sources will necessarily lead to more diverse consumption. Using two right-wing sources is arguably more diverse than using only one. We can go one step further, however, and measure whether social media users — and especially those incidentally exposed to news while using social media for other purposes — do in fact report using more politically diverse sources of news. We do this by assessing the partisan leanings of different news sources and in turn using this measure to calculate the political diversity of people’s news diets. In each country, we divide news sources into those with a mostly left-leaning audience, and those with a mostly right-leaning audience (with the midpoint the average position on the left-right spectrum amongst the population as a whole).2 When we do this for the 15 most popular news sources in each country, we can visualize it in a manner similar to Figure 2. In the U.S., 43 percent of Huffington Post news users self-identify on the left, compared to just 10 percent on the right, meaning that the news audience for The Huffington Post is to the left of the population as a whole. Conversely, just 9 percent of Fox News online users are left-leaning, and 48 percent are right-leaning. This way, we can use the partisan composition of an outlet’s audience as a proxy for its political leaning. Figure 2. 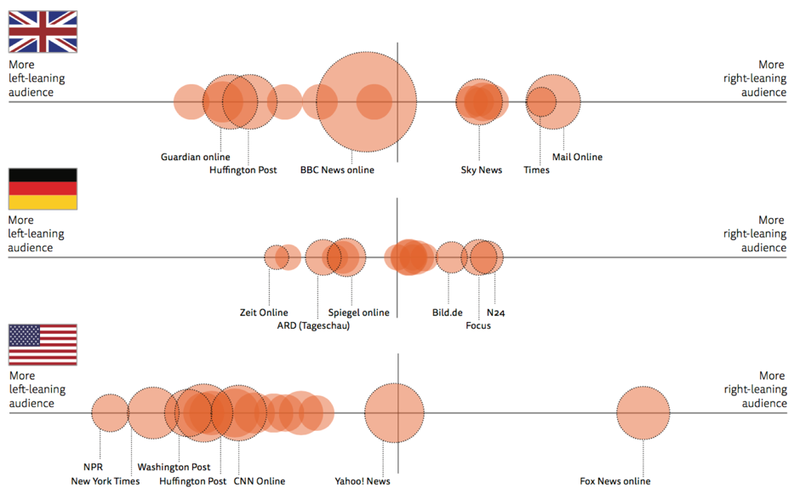 Online news audience polarization. With these partisan leanings of individual outlets in mind, we can look at our three groups of social media users (news users, those incidentally exposed to news on social media, and the non-users) and determine the proportion within each group who say they use at least one source from both sides of the political spectrum (i.e. from both sides of the “midpoint within country”). The results are in Figure 3. Figure 3. Proportion who use both a news source with a left-leaning audience, and a source with a right-leaning audience. Two things are immediately striking. First, the majority in most countries and in most groups do not use sources from across the political spectrum. But also, second, that both social media news users and those incidentally exposed to news on social media not only (a) consume news from more sources but also (b) have a more politically diverse online news diet than those who do not use social media at all. In the U.S., just 20 percent of those who do not use social media consume news from online brands with left-leaning and right-leaning audiences. Few people, when left to their own devices, opt for a politically diverse news diet. However, the figure rises to 37 percent for those incidentally exposed to news on social media, as they see news links posted by people with different views and different patterns of news consumption. 44 percent of those who use social media for news end up using sources from both the left and the right — more than double the number for non-users. We see the same pattern in both Germany and the U.K. Again, these differences remain significant after we control for other factors. We have focused here on whether social media use leads to narrow filter bubbles or whether algorithmic filtering in its current forms drives greater diversity through distributed discovery. We have shown that social media use is consistently associated with more, and more diverse, news diets, and that the difference is clear even for the incidentally exposed, those who use social media for other purposes and come across news while doing so. Preliminary analysis of other forms of algorithmic filtering like search engines and news aggregators indicate similar results. Richard Fletcher is a research fellow at the Reuters Institute for the Study of Journalism at the University of Oxford. Rasmus Kleis Nielsen is director of research of the institute. 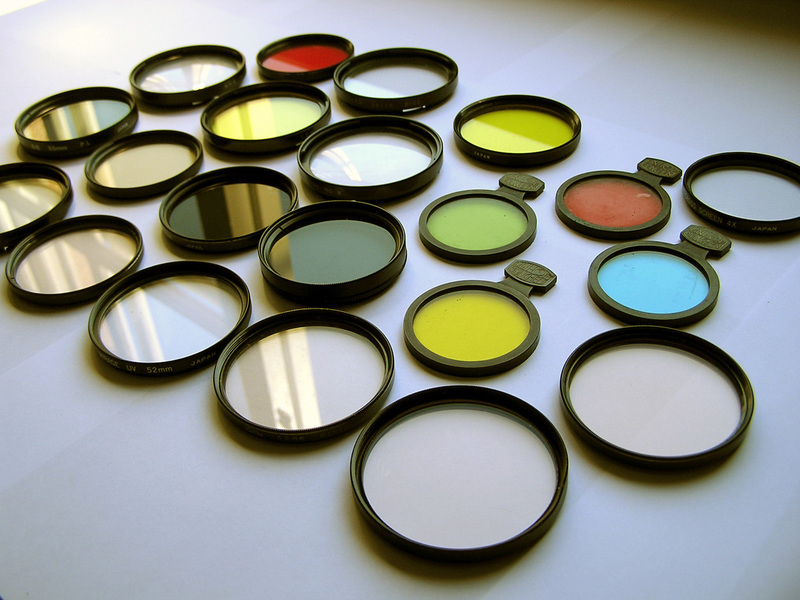 Photo of filters by Nadar used under a Creative Commons license. POSTED June 21, 2017, 7:01 p.m.
Fletcher and Rasmus Kleis Nielsen, Richard. "Using social media appears to diversify your news diet, not narrow it." Nieman Journalism Lab. Nieman Foundation for Journalism at Harvard, 21 Jun. 2017. Web. 18 Apr. 2019. Fletcher and Rasmus Kleis Nielsen, Richard. "Using social media appears to diversify your news diet, not narrow it." Nieman Journalism Lab. Last modified June 21, 2017. Accessed April 18, 2019. https://www.niemanlab.org/2017/06/using-social-media-appears-to-diversify-your-news-diet-not-narrow-it/.